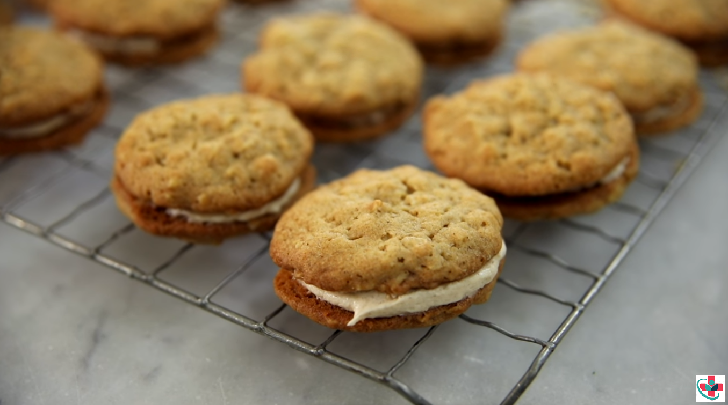 Soft and chewy peanut butter cookies are sandwiched together with delicious vanilla buttercream to create the perfect dessert. In a stand or electric mixer, cream peanut butter and butter together until very smooth. Add sugars and continue to beat until very creamy. Add in eggs and vanilla and mix until well combined. In a separate bowl, whisk flour, baking powder, and baking soda together. Mix dry ingredients into peanut butter mixture just until combined – don’t overmix! Roll dough into 1 tablespoon balls* and place 2-3 inches apart on a baking sheet. Press down with a fork to make a criss-cross pattern. Bake cookies at 350⁰ F for 10-12 minutes or just until edges are golden (mine took exactly 11 minutes). Let cool for 5-10 minutes before transferring to cooling rack. If you like crispier cookies, simply bake for longer. In the bowl of a stand mixer fitted with the paddle attachment, beat butter on medium-high speed for about 5 minutes. This process will lighten the color of the butter and ensure you buttercream in extra fluffy. Turn the speed down to low and gradually add the powdered sugar. Continue mixing on low speed until the powdered sugar is completely incorporated. Add in vanilla extract and milk and mix until combined. Turn mixer back up to medium-high speed and beat the mixture for an additional 3-5 minutes. If needed, add a little more cream 1 teaspoon at a time until you reach the consistency you desire. To assemble the cookies, pipe or spread the cream filling on the flat side of half of the cookies and put the remaining cookies on top.